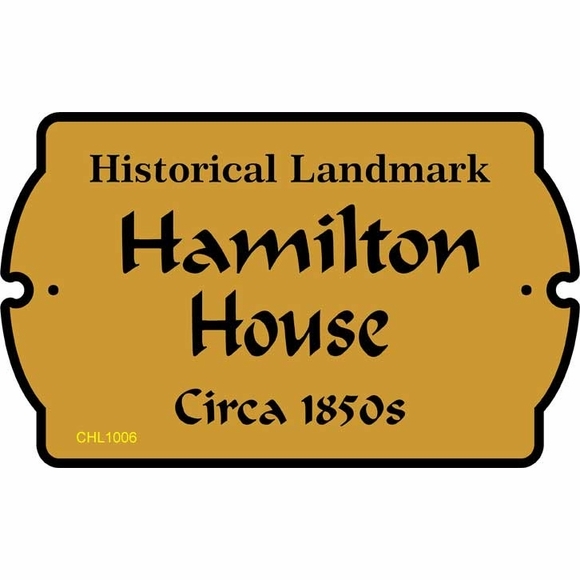 Personalized Historical Landmark Plaque - - personalized historic site sign accents and adds meaningful curb appeal to a colonial style home and other colonial era buildings and landmarks. 10" x 6" wall mount plaque. Three lines of personalization. Made in USA. 10" x 6" wall plaque inspired by a shape and font that might have been found on a colonial era building. Customized with your choice of color and the three data lines. Made from sturdy and UV-stabilized non rusting, laminated acrylic plastic with engraved personalization. Line 1 holds up to nineteen (19) characters. Historical Landmark as shown in the sample is one possibility. Feel free to supply alternate wording. Lines 2 and 3 hold up to ten (10) 1.25" characters each. Line 4 holds up to fourteen (14) 0.625" characters. You can personalize this line with the year as shown. Typically a word such as Circa, Established, Founded, Built, or Restored precedes the year or actual date. Or perhaps the name of a founder, builder, or first owner. Note: the style number visible on the sample signs (in this case CHL1006) is for internal use only and not part of your custom sign. Personalized Historic Site signs are also used for interior entry ways, walls, and individual room doors to highlight the structure's individual features.